FFA Fundraising Cookie Dough for FFA Chapters Nationwide! 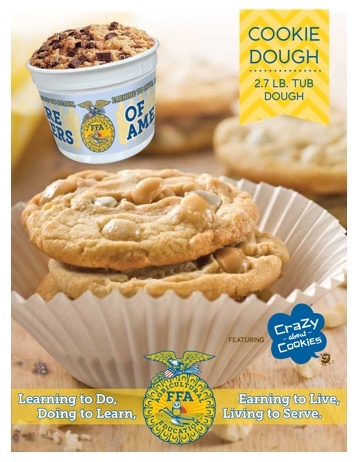 FFA Fundraising Nationwide in All 48 Contiguous States with Cookie Dough packed in 2.7 pound Tubs with The Official FFA Colors & Logo on White Tubs displayed in the ‘FFA Blue and Gold’ with High Profit Margin . . . up to 50%!!! - All Star 1 Fund Raising, for over 31 Years since 1985 . . . has done Fundraisers Nationally in All 48 States! - This Delicious Pine Valley Cookie Dough will last 21 days at room temperature or 77˚ and also may be refrozen. - Great fundraiser to do year-around or 12 months out of the year! • Junior High and • Middle School • FFA Chapter Fundraisers . . . Nationally, in ALL 48 Contiguous States! Back to Pine Valley’s (6) Fundraisers!!! Call us Now for Your Next Successful Fundraiser!